Well the romance (with Dosa) started quite early. Definitely Port Blair’, 1988 where Annapurna restaurant in Aberdeen market would offer a Dosa for just 5 Rs which we inevitably had whenever we could find an excuse for. This was just the beginning of the Dosa story where the cast included some south Indian Naval officer’s wives/Aunties, beautiful moms of lovely South Indian friends, my Nilgiri hill Girl friends in Bangalore Sports Camp, Nuway cafe in Kurukshetra, East Ham joints in London and recently added Luton A1-Dosa. The story had some villains as well. My Mom , counting my calories , for one day she had to get me married off, my bank balance for obvious reasons & the worst of all my laziness to learn the trade. 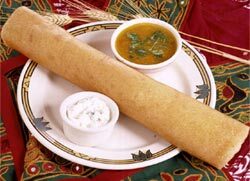 The art of Dosa still remains a dark tunnel for me where I can always see the light at the other end but the thought of traversing the long, spiralled path gives away in front of my craving to have one, ending my journey at either Chennai Dosa or Saravana Bhavan. Have you been through this haunted tunnel & how many times have you come unscathed? First Demon is Sorida -soaked Rice & Daal.. I’ll never be sure how many hands & legs of Rice & daal you need to cut. I always end messing’-up with it making the demon scarier. Second - GRIPA- The Grinded-Paste. For you to cross this hurdle you need some special weapons .My mom used to call it Sumeet Mixi but my mom-in-law tells me Usha-grinder is better. If you are lucky enough to cross this stage you need to pray one whole night for an invisible divine soul to ferment it ,for they in the process of fermenting can only decide if your Dosa is going to be a crispy one or a duhh. shyam! u r roasted for life.what a pity. Appa :I think nowI can pass the batton to Shyam to give a try if he doesnt want to be roasted for life. I am replying to.you quite late but looks like over the years the dosa making art has improved a bit.